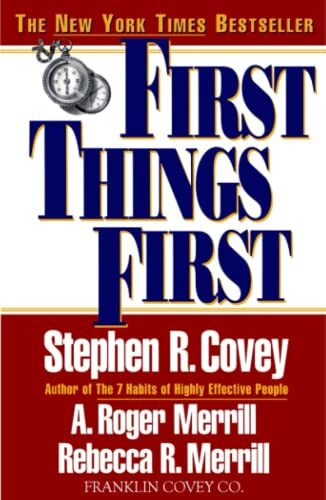 My Mastermind Group in Bellingham is reading the Steven Covey book, ‘First Things First.’ One of my book clubs read Covey’s ‘7 Habits’ book and this was the perfect follow up. The book is a classic for a reason – it’s got some great recommendations and advice for getting your life under control. This is a great book for me personally to read because I struggle with my schedule and getting everything done. In the book, Covey discusses the concept of the Four Quadrants. He recommends trying to spend the bulk of your time in Quadrant II, or the ‘important, not urgent’ cateogry. Covey makes the case that many people spend all of their time putting out daily fires and never truly work on things that move them towards their ultimate life vision. Daily fires are (a) a waste of time and (b) leads to something he dubs ‘urgency addiction.’ This is when you literally become addicted to the adrenalin rush that happens when you solve an emergency. This happens more and more when you over promise, when you can’t say no, when you over schedule yourself or when yousimply haven’t taken the time to truly thing through your week and find yourself surprised when things come up. Curious if you’re addicted to urgency? You should get the Covey book to take his full quiz or there is a small one here that might give you a window into your answer. When you live your life only in Quadrant 1 or 3, you never feel in control and never feel like you’re done with anything. But, if you plan your schedule around completing things that are truly important and not urgent, it can actually reduce the time you spend in other quadrants. The key is that our daily tasks and priorities need to be consistent with our lifelong goals and vision. The way to do this by determining your vision for your life and following it up with good planning. Covey literally has you write down every single task that you need to do, rank them and then do them in order of importance. The main thing is to not get bogged down with the tiny details and instead, take a bird’s eye view of your entire week and plan your week around the things that really matter to you. Covey recommends taking 1 hour every week to literally plan your entire week out, rather than being reactive all week. In this system, you drive your schedule – your schedule shouldn’t drive you. I’m experimenting with one of the Covey scheduler’s that is fully online – PlanPlusOnline and really liking it. But, I’m a go-go-gadget kind of gal so anything that is high tech, I’m prone to like. This is basically my simple notebook online and on steroids. The other gals in my Mastermind Group have used more of the weekly, paper based planner like you can find here. No matter which method you use, it is liberating to plan your life around your big ‘rocks’ (working out, time with family) rather than just trying to schedule task, after task, after task and never getting it all done. Jes, Using the planplusonline.com software seems to be keeping me on track. But, it's only been a few weeks so talk to me in a few weeks! Erica, I hear ya' about only using the tools that are available when you're overwhelmed. It's totally my MO too. But, I'm trying to be pro-active so I don't end up feeling too overwhelmed too often. Diane, You should totally read it – in conjunction with the 7 Habits. They make great companion books. urgent and simply don't do it lol. do the truly important things! I like your summary of the key points of Covey's book–some immediate helpers to keep on track until I get to the book! I learned this system. I use it but not regularly – only when I am getting overwhelmed. I've never seen a schedule for it though. I must get that and give it a try. I read this book a while back and it makes a lot of sense… Unfortunately, my problem is in implementing and following up. Good book though.